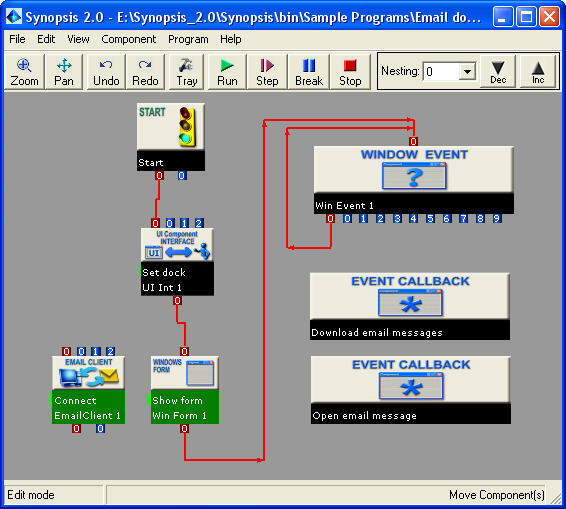 Synopsis is a visual programming and rapid application tool that allows you to rapidly design and prototype Windows applications using visual programming techniques and with no traditional coding. With Synopsis you can significantly shorten development cycles and design phases all the while providing an effective development communication tool for your organization. Use the real-time programming features of Synopsis to fine-tune application behaviours on the fly. Reuse existing code in DLLs. Connect to SQL databases. Build stand-alone executables. System Requirements: Windows XP/2000/2003/98, Microsoft .NET Framework 1.1 or higher, Microsoft DirectX 9.0c, 800+ MHz processor speed (recommended), 128+ MB RAM (recommended). 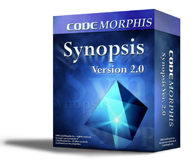 "I was about to say 'goodbye world' to my programming aspirations when I stumbled across Synopsis. It was one of those Eureka moments." "Thank you for a great product and support. ... You have an unbelievable program." "I said to myself back in '97, that I wish I could have a development environment for Windows applications programming that allowed me to focus totally on the logic and not the syntax de jour. Thank you for Synopsis, it is the Windows programming Messiah I believe." Synopsis is a completely visual RAD tool for Windows that frees you from having to write textual code and learning unnecesary programming details. With Synopsis you can concentrate on creating software instead of wrestling with mundane and complex low-level development tasks. Tell me more about Synopsis! Download a free demo of Synopsis here and unleash your creative programming power! View an online demo of Synopsis here. To access online visual programming tutorials and other helpful tips on how to rapidly prototype Windows applications with Synopsis visit our Programming Forum.